Every year I spend an entire day out in the school yard to teach third graders about solar cooking. My inner city school's main focus is science and critical thinking. During the day I integrate all the curriculum areas. We carry out our chairs, pencils, science notebooks, the sun oven, a clock, a giant thermometer, ingredients, utensils and posters for vocabulary, recipes, and sun facts. We begin our lesson with safety, being careful not to look into the sun. They are taught about when, how and where they can touch the oven. We chart the inside and outside temperature in Celsius and Fahrenheit and describe the sky every 15 minutes throughout the cooking process. Then I set out a picnic tablecloth on the ground as we discuss what ingredients (nutritional values) and utensils are needed for baking corn bread. Each child gets to measure, pour and stir the ingredients. By the time we put the pan in the oven it is time for our first recess. To promote English language, each of my students has to explain the oven to another child from other classes. For physical education we include the yoga positions to "Salute to the Sun". For Social Studies and Science, we learn about how many other countries use wood or coal for cooking and the environmental impact of deforestation it has on the earth. We learn about health hazards of smoke , the economics of how people use their income to buy fuel and compare our cooking resources. The children draw detailed pictures, read stories and then write a five paragraph essay about the solar oven. We enjoy a piece of corn bread and last we sing "Here Comes the Sun." Thank you very much for sharing with us and our site visitors the great narrative on how you introduce every year solar cooking to the youth of your community. I think it is a very good thing to start out when they are young. 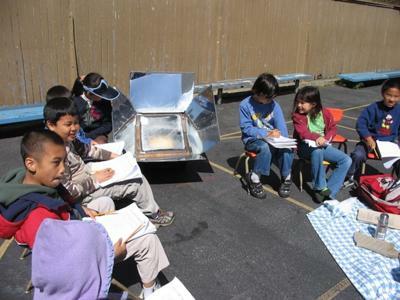 I know many teachers who think and feel the same way about using solar cooking as an excellent tool for teaching many scientific principles as well as a more responsible lifestyle. I hope this will inspire more people to do the same, especially those who teach children. Thanks for sharing your experience and the details of one day out solar cooking. 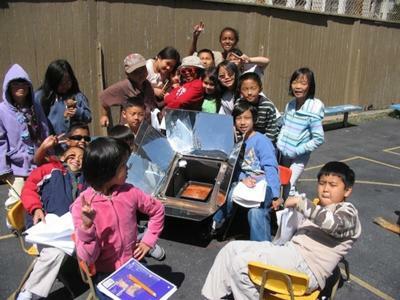 There is so much that can be taught or discussed with the students on solar cooking day. It is nice that the kids learn about the environment damage due to using fossil fuels,like firewood. I wish more schools do similar programs for elementary school kids.